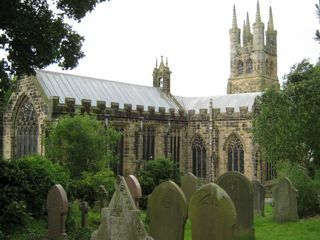 An enormous and extravagant church for a small Peak District parish gives St John the Baptist the nickname Cathedral of the Peaks and puts it on the summer coach party itinerary. The earliest legible gravestones date from the 1750s. Some of the earliest have been re-laid as paving around the boundary wall and being worn and partly covered by grass are difficult to read. Most pre-1950 gravestones and monuments inside the church have been photographed probably representing about 80% of the total. The GPR holds 228 grave and 515 person records for the burial ground.